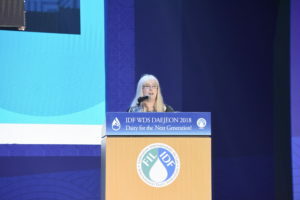 This IDF World Dairy Summit has been a true platform for dialogue, knowledge-sharing and establishing mutually beneficial networks which will help shape the dairy sector. From the wonderful speech given by former Secretary General Ban Ki Moon at the opening of the Summit, to each and every conference and special session right up until the end – the quality, passion and commitment of the speakers and delegates was clear. I am certain that everyone who attended the Summit will have benefited in a unique way. My heartfelt thanks and deepest appreciation to our most generous host, the IDF National Committee of Korea and the Organizing Committee for their excellent staging of the Summit. They deserve not just applause but a standing ovation for their outstanding delivery of a world class Summit wrapped up in such warm hospitality. They certainly have my respect and friendship, and I know many of you feel the same way. 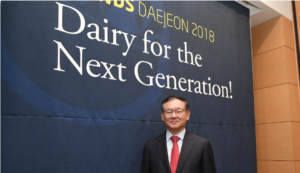 A big ‘Thank You’ once again to the President of IDF Korea, , Mr Lee Chang Buhm, who was also Chair of the World Dairy Summit 2018 Organizing Committee, and his dedicated team for making this year’s Summit one to remember!